THE EPO‘s management is starting to shake up as affairs have been rocky and criticism comes from the European media (except German media) on a more regular basis. As for Lucy, showing off her connections to Battistelli (see photo above), she too is out, not long after we leveled/directed criticism at her, speaking against what she did (as did other people, usually anonymously). Let VP1 never forget that life and the world are what we make them by our social character; by our adaptation or want of adaptation to the social conditions, relationships, and pursuits of the world. To the selfish, the cold, and the insensible, to the haughty and presuming, to the proud, who demand more than they are likely to receive, to the jealous, ever afraid they shall not receive enough, to those who are unreasonably sensitive about the good or ill opinions of others, to all violators of the social laws, the rude, the violent, the dishonest, and the sensual, to all these, the social condition, from its very nature, will present annoyances, disappointments, and pains, appropriate to their several characters. The benevolent affections will not revolve around selfishness; the cold-hearted must expect to meet coldness; the proud, haughtiness; the passionate, anger; and the violent, rudeness. Those who forget the rights of others, must not be surprised if their own are forgotten; and those who stoop to the lowest embraces of sense must not wonder, if others are not concerned to find their prostrate honour, and lift it up to the remembrance and respect of the world. 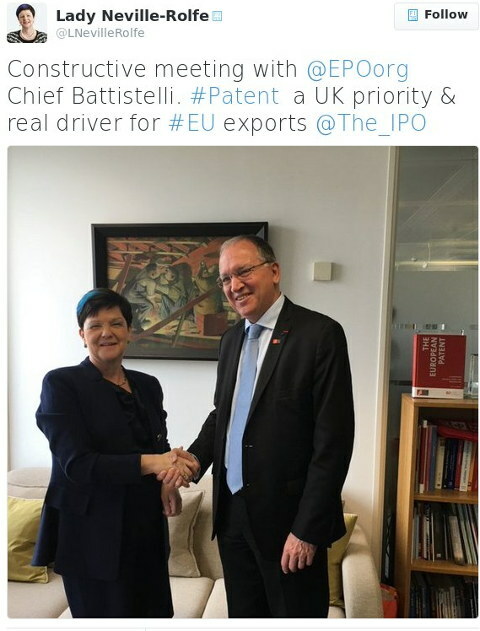 What will that mean for the Unitary Patent? Nothing good, that’s for sure. The assurances came from Lucy (intention to ratify), so what happens now? The FR ex Lieutnant-colonel from intelligence services (don’t laugh) who had been recruited at administrator’s level by PD HR to officially deal with “social dialogue and communication” (actually she worked at preparing files to charge SUEPO officials to get them fired) and then bombarded within no time at director’s level (after another fake selection procedure), would now be back to square one (see the phone book). Game over, exit the “social dialogue” work with PD HR. Apparently a sudden and rather unexpected change of both dept and function (now she is simple Private “head of service” position in charge of security). At first glance this position would suit better her profile but when one remembers the shamble around the dismissals…one may worry for “security at EPO”. In any case something big must have happened between the two ladies who once were the best pales in town. Trusting PD HR is a risky bet: the later acts exactly as her mentor (Battistelli) does: find one to blame with her wrongdoings.